The find is already challenging conventional wisdom about how Stonehenge was built – and what it was used for. Bluehenge was put up 5,000 years ago – around the same time as work began on Stonehenge – and appears to have been a miniature version of it. The two circles stood together for hundreds of years before Bluehenge was dismantled. 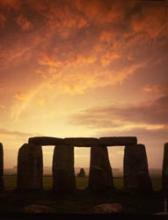 Researchers believe its stones were used to enlarge Stonehenge during one of a number of redevelopments. All that remains of the 60ft wide Bluehenge are the holes of 27 giant stones set on a ramped mount. Chips of blue stone found in the holes appear to be identical to the blue stones used in Stonehenge. The four-ton monsters, made of Preseli Spotted Dolerite – a chemically altered igneous rock harder than granite – were mined in the Preseli Mountains in Pembrokeshire and then rolled, dragged and floated the 200 miles to the site on the banks of the Avon in Wiltshire. Once installed, the stones would have been polished to a dark blue with silver flecks resembling the night sky. Bluehenge lies at the end of the ‘Avenue’ – a ritual pathway that connected Stonehenge to the Avon. Stonehenge itself was built and rebuilt over 600 years in three main phases. The first – begun in 3000BC – saw the creation of a ditch and bank which later enclosed a circle of 56 holes for posts or stones. Around 2600BC the site was transformed into two circles of 82 blue stones brought from the Welsh mountains. Then, 150 years later, the ancient Britons set up 50-ton sarsen stones quarried at Marlborough, 25 miles away. The blue stones were dug up and repositioned, and the sarsens used to create the Stonehenge familiar today. The new find changes this account of this history. It suggests that the creators of Stonehenge originally built two circles – one with 56 stones at Stonehenge, and another with 27 at Bluehenge. The stones of the smaller circle were eventually incorporated into the bigger one. Bluehenge was discovered by Professor Mike Parker Pearson, of Sheffield University, who argues the monuments were linked to rituals of life and death. Julian Richards, archaeologist and presenter of BBC2 TV series Meet The Ancestors, believes, however, that such certainty is beyond our reach. ‘Any one person who says they have the answer is being a bit over-confident,’ he said. Professor Geoffrey Wainwright, who found the source of the Stonehenge stones in Wales with Professor Darvill, said: ‘This [new] henge is very important because it forms part of the picture of ceremonial monuments in the area and puts Stonehenge into context. 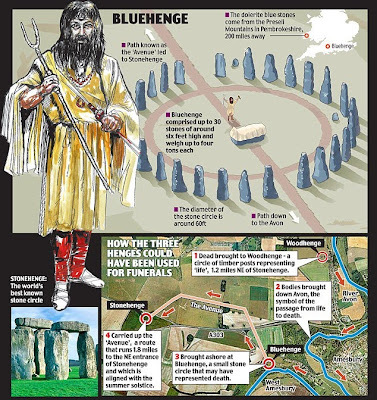 Lovers of prehistoric sites will have to wait until February before the full details of Bluehenge are published. The creators of Stonehenge – who saw the Stone Age pass into the Bronze Age – were farmers who lived in small villages in huts made of wooden stakes and twigs, covered with a thick layer of clay and chalk. Farming had been established for at least 1,000 years and the builders of Stonehenge were skilled at growing wheat and barley and keeping pigs and sheep. Some experts believe they made cider and beer and ground wheat into flour to make bread and cakes. But they were still forced to depend on wild fruit, peas, lentils, nuts and honey. Clothes were primitive leather coats and jackets, woollen leggings and simple shoes made of skins bound with twine. No one knows what gods they worshipped, but the alignment of Stonehenge to the solstice shows that the Sun – and maybe the Moon – was important.